A possible new series that I’d like to work on. 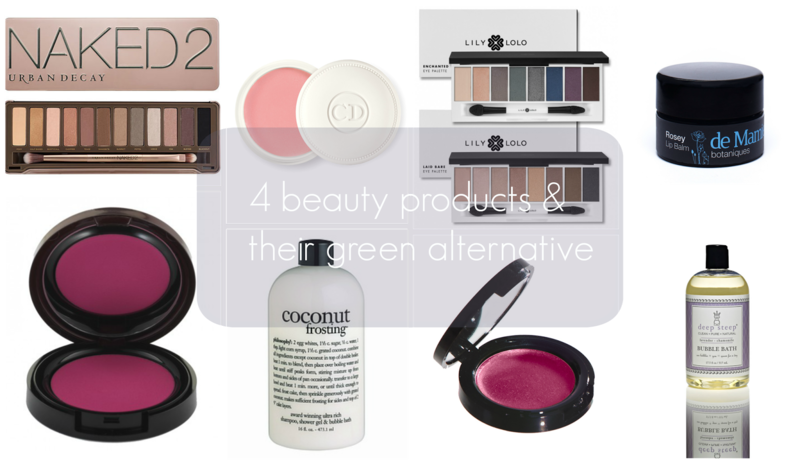 The green beauty department has been increasing exponantially and we’re starting to see an exciting variety of makeup and skincare products that can without the shadow of a doubt rival the mainstream beauty products. So this would be what I consider the closest natural alternatives* to some popular beauty products. Starting off with lips and cheeks. be build up for a more pigmented pop of color. The first and main problem with this product is the fact that it contains Propylparaben, a human endoctrine disruptor, proven highly carcinogenic (score of 10 on EWG!) This shouldn’t appear in any product, period. Ingredients: Caprylic/Capric Triglyceride, Trioctanoin, Neopentyl Glycol Dicaprate, Tridecyl Trimellitate, Dicalcium Phosphate, Candelilla Wax, Microcrystalline Wax, Carnauba, Glyceryl Dilaurate, Ceresin, Grape Seed Oil, Octyldodecanol, Lauroyl Lysine, Propylparaben, Ethylcellulose, Tocopherol, Ascorbyl Palmitate, Lecithin, Citric Acid. May Contain (+/-): Mica, Titanium Dioxide, Iron Oxides, Carmine, Ultramarine Blue, Manganese Violet, Ferric Ferrocyanide, FD&C Yellow 5 AL Lake, D&C Red 30, FD&C Yellow 6 AL Lake, D&C Red 6, D&C Red 7 CA Lake, FD&C Blue 1 AL Lake. After seeing pictures, and reading more about the product, I didn’t think twice : La bella Figura’s Radiant blush in “Just Jenna” seemed like the perfect choice. Aside from the similar packaging and shade, La Bella Figura has a creamy texture and provides a natural flush of color. It’s also safe to use as a lip color, as reported by the lovely Lilly from Genuine Glow. However, the best part remain the high-quality ingredients: free of parabens, synthetic materials and preservatives, Just Jenna is a stunning blend of exotic and luxurious oils, vegetable butters and flower extracts. Vegan, Gluten and GMO-free too. Your cheeks (and lips) are in for a treat, and they deserve nothing less. Crème de Rose has been very popular in the beauty blogosphere, and it’s an SPF 10 rose-scented lip balms, that nourishes and re-plums the lip. When I searched for the ingredient list, I was quite shocked by how long it was! The brand puts the emphasis on three elements the rose of Damas essential oil, Vitamins A and E and shea butter. Technically with these three you could make a lip balm, but they only appear in (very) low concentrations here. ( I couldn’t find the rose oil, unless it’s what they call “Parfum”…). Truth is, you’re paying a whopping price for a synthetic lip balm. Oxides), Ci 77742 (Manganese Violet)]. Annee de Mamiel Rosey lip balm. 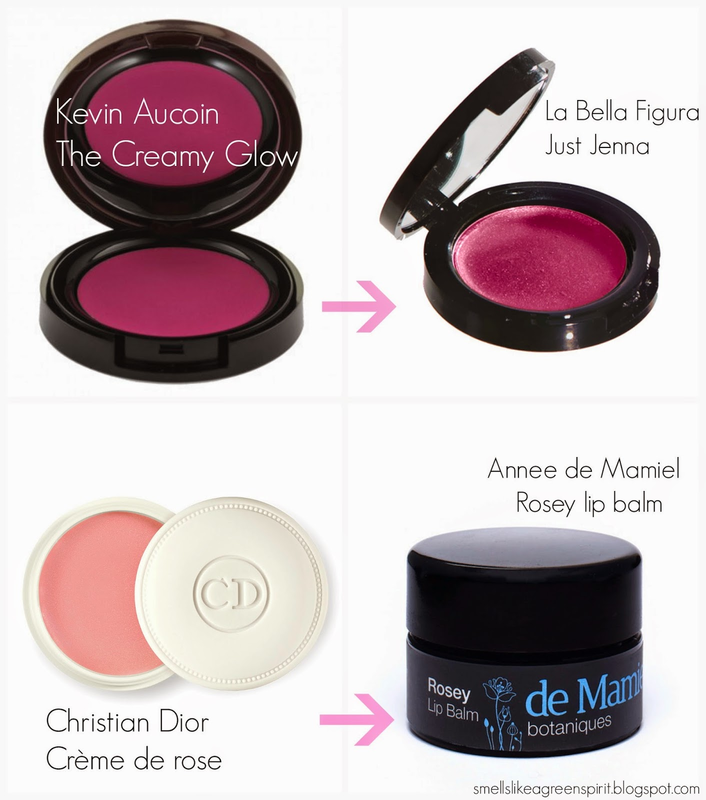 As a self-proclaimed lip product addict, I have tried countless of balms and the Rosey lip balm truly is a stand out. It has the perfect consistency, not too oily, not too waxy, just luscious. Lips feel instantly nourished. It smells like a fresh bouquet of roses and the title “Crème de rose” would rightfully apply for De Mamiel’s lip balm, because as you can tell from the ingredients, it actually contains natural rose extract. (note : I recently tried a sample of R.L. Linden’s La Balmba Rosa, and this might also be a fantastic US alternative!) The ingredients speak for themselves, unlike Dior’s balm, there are no synthetic ingredients in the Rosey balm. Lolo alternatives for the other UD palettes as well. and cancer. PTFE (Teflon) when in high doses has a risk of toxicity. You may also know about the Teflon coated cooking pans, and how heating teflon is proven dangerous. Ingredients: Talc, Caprylic/Capric Triglyceride, PTFE (Teflon- polytetrafluoroethylene), Zinc Stearate, Sodium Dehydroacetate, Phenoxyethanol, Sorbic Acid, Ethylene/Acrylic Acid Copolymer, Silica, Ethyhexyl Palmitate, , Boron Nitride, Calcium Sodium Borosilicate All Shades May Contain: CI 77019 (Mica), CI 77891 (Titanium Dioxide), CI 77491/77492/77499 (Iron Oxides), CI 77000 (Aluminum Powder), CI 75470 (Carmine), CI 77510 (Ferric Ferrocyanide), CI 77742 (Manganese Violet), CI 77163 (Bismuth Oxychloride). A beautiful collection of eight eye shadows (shimmer, semi-matte and matte). The Laid Bare palette offers a lovely range of neutral shades, and as you can see some are quite similar to Urban Decay. Lily Lolo provides greatly pigmented shadows. They are talc-free, and packed with pomegranate seed oil which is often used to protect the delicate eye area from, manuks for its antimicrobial properties, and nourishing ingredients ( jojoba – and argan oil). Special mention to Silk Naturals, which also sell stunning Urban Decay color dupes! You can have a look at the comparison here (click). Also, if you’d like to make your own pressed palette, you need to check out lovely Ru’s (Short, Small & Sweet) super useful post about DIY pressed eyesdahow palette. I can’t really imagine what Lavender pound cake smells like, but I assume it’s very sweet. What bothers me more is the presence of known irritants such as Sodium Laureth Sulfate, fragrance (8 on EWG) and Methylchloroisothiazolinone. The presence of Maleic Anhydride is also troublesome, it is linked to allergies when in direct contact with skin, and is classified as a human respiratory toxicant and harmful when used on the lips or around the mouth. I don’t know about you, but as a kid I loved putting on a bubble beard, and I’d prefer to use a bubble bath product that is a bit safer. Ingredients (for the Peppermint one, couldn’t find the ingredients for Lavender) : Aqua/Water/Eau, Sodium Laureth Sulfate, Lauryl Betaine, Ppg-2 Hydroxyethyl Cocamide, Parfum/Fragrance, Glycerin, Glycol Distearate, Allantoin, Aloe Barbadensis Leaf Juice, Helianthus Annuus (Sunflower) Seed Oil, Panthenol, Camellia Sinensis Leaf Extract, Tocopherol, Tocotrienols, Triolein, Trilinolein, Polyquaternium-7, Polyquaternium-10, Maltodextrin, Methyl Gluceth-20, Sodium Sulfite, Sodium Benzotriazolyl Butylphenol Sulfonate, Polysorbate 20, Disodium Laureth Sulfosuccinate, Buteth-3, Tributyl Citrate, Sodium Chloride, Magnesium Chloride, Magnesium Nitrate, Sodium Benzoate, Citric Acid, Disodium Edta, Potassium Sorbate, Maleic Anhydride, Sodium Hydroxide, Methylene Di-T-Butylcresol, Caprylyl Glycol, Hexylene Glycol, Phenoxyethanol, Methylchloroisothiazolinone, Methylisothiazolinone, FD & C Yellow No. 5 (CI 19140), D & C Red No. 33 (CI 17200). To me, it’s a no-brainer, the bottle might not be pink, but it bubbles and smells like Lavender dream. Cruelty-free, and really gentle for the skin, Deep Steep is my go-to bath product for a sweet and relaxing pamper session. The scent is not overpowering, and I didn’t experience any redness nor irriations. The scents of Lavender and Chamomille combined provide immediate soothing and relief. Ingredients : Organic Aloe Barbadensis (Aloe Vera) Leaf Juice, Infusion of Organic Herbs; Lavandula Angustifolia (Lavender) Flower Extract, Anthemis Nobilis (Chamomile) Flower Extract, Coco Glucoside, Glycerin (Vegan), Retinyl Palmitate (Vitamin A), Aroma (Organic and Wildcrafted Aroma Blend), Ascorbic Acid (Vitamin C), Caprylic Acid (Coconut Fatty Acid), Tocopherol (Vitamin E) Natural, Potassium Sorbate, Citric Acid. What do you think of this series? Would you consider these as alternatives, have your tried any of these? claiming the green alternatives would be identical, I can speak for them, because I have tried almost all of them. I’m not making the green switch an imperative, you’re free to decide for yourself. If you enjoy any of the non-green product listed, it’s fine. These are only suggestions, in case there are some people looking to gradually switch to more gentle and natural alternatives. I have a very similar series on my blog as well! Can't wait to give that La Bella Figurs cream blush and the de Mamiel balm. I've heard great things about both! Great post! I can't wait to get my hands on the Lily Lolo eye shadow palette. I really hope that you can continue on with this series. I really like the idea of finding natural dupes for high street brands! Nice work! What a terrific idea/post. This loyal reader would love more of the same. Wanna try so much la bella figura (funny name LOL) make up..looks so luxury!! The lily lolo brand is so reasonably priced and chic! I really need to give the line a try! Thanks for these great recommendations!